Our customer in Doncaster had lived in their house for 7 years. 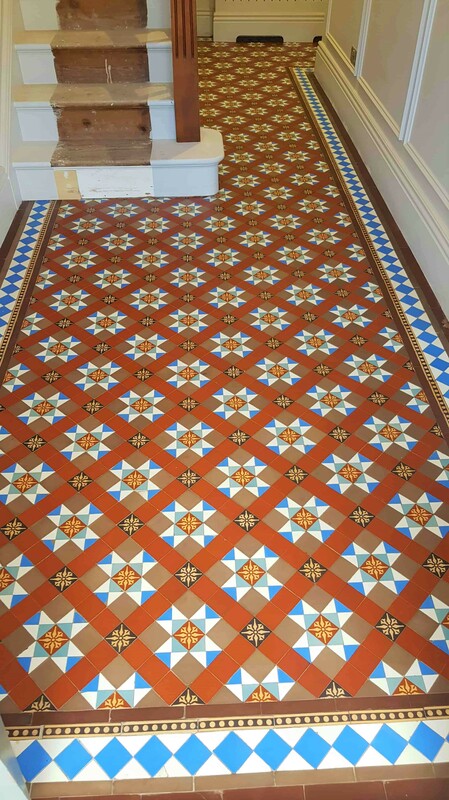 The property had lots of lovely period features along with a beautiful patterned Victorian tiled hallway. 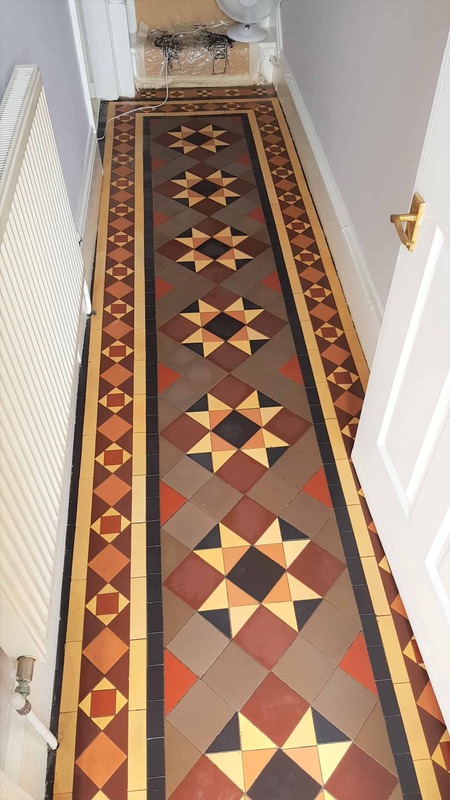 Since moving in they had not done anything to restore the appearance of the hallway floor, although they were very aware they wanted to preserve the floor but unsure what could be done to fix it and get it back up to scratch. 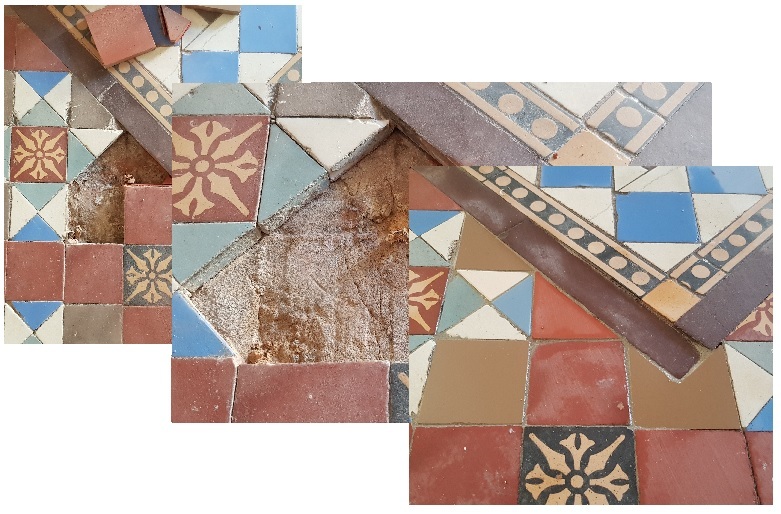 Over time the floor had become increasingly ingrained with dirt and very difficult to keep clean, so they decided to do something about it and contacted Tile Doctor. I visited the property, came up with a plan of action, agreed a price and booked the job in for the following week. First task was to remove any old sealers or waxes that may still be present on the floor. 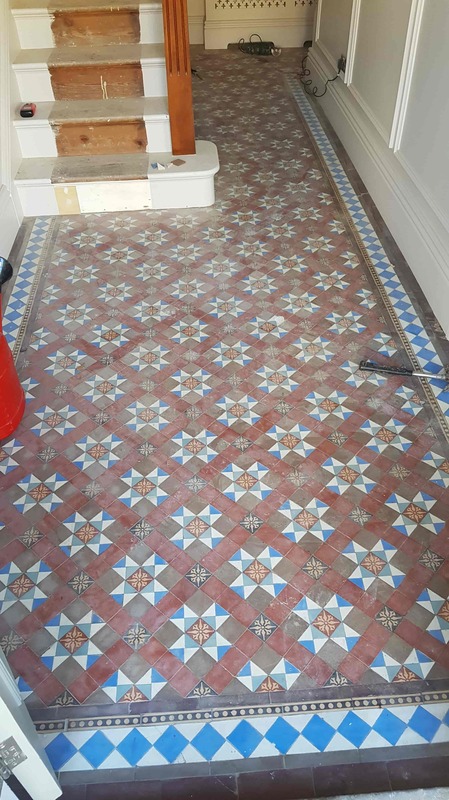 There are several ways to do this but for this job the floor I decided to treat it with Tile Doctor Remove & Go, which was left to dwell for a good ten to fifteen minutes before being agitated with a rotary floor machine fitted with a 400-grit diamond burnishing pad. Remove and Go is a multi- purpose stripper that breaks down most coatings and sealers. It also has the benefit of drawing out ingrained stains and any heavy grease build up. The resulting slurry was then rinsed off the floor with water and a wet vacuum. After that the floor was inspected and it was clear more work was required to remove the years of dirt. Given the age of the property I was sure no damp proof membrane would have been installed prior to laying the floor. This can often lead to a build-up of alkaline salts in the floor that might appear as efflorescent white spots as the floor dries after cleaning. To finish off cleaning the floor and to counter any alkaline salts I gave the tiles a clean with Tile Doctor Oxy-Gel combined with Tile Doctor Acid-Gel. 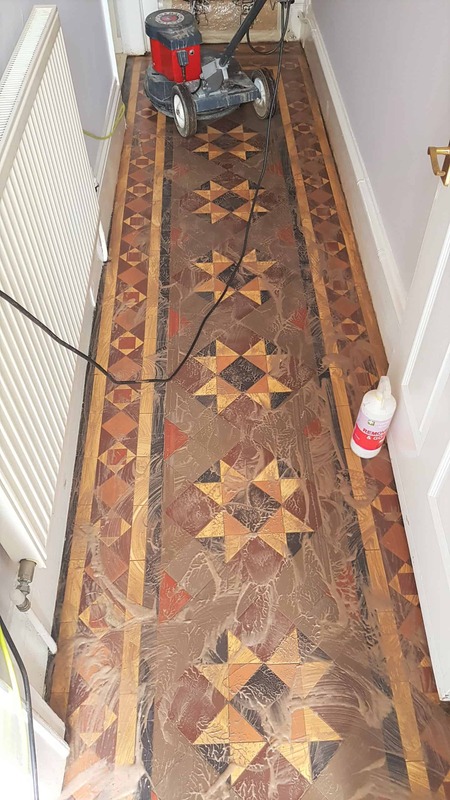 I used the same process as before, allowing the products to soak into the tiles for ten minutes and then scrubbing the hallway floor with the 400-grit diamond burnishing pad fitted to a rotary floor machine. Once again, the solution was rinsed off the floor with water and then extracted with a wet vacuum. The floor was wiped clean with damp microfibre clothes and left to dry off overnight. I came back a few days later to allow for the hallway floor to have fully dried out, I also double checked it was fully dry by using a moisture meter. Satisfied that the floor was ready for the sealing process I started to seal the tiles. 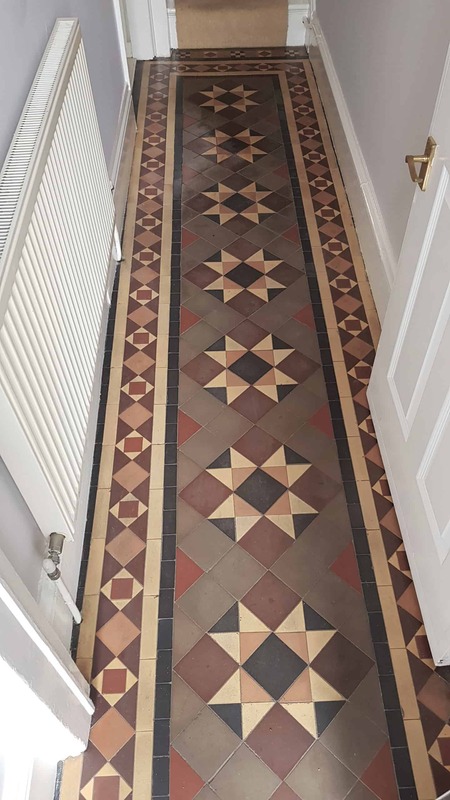 For this I used five coats of Tile Doctor Colour Grow which is a colour enhancing impregnating sealer that leaves a matt finish and will protect the floor for years to come. 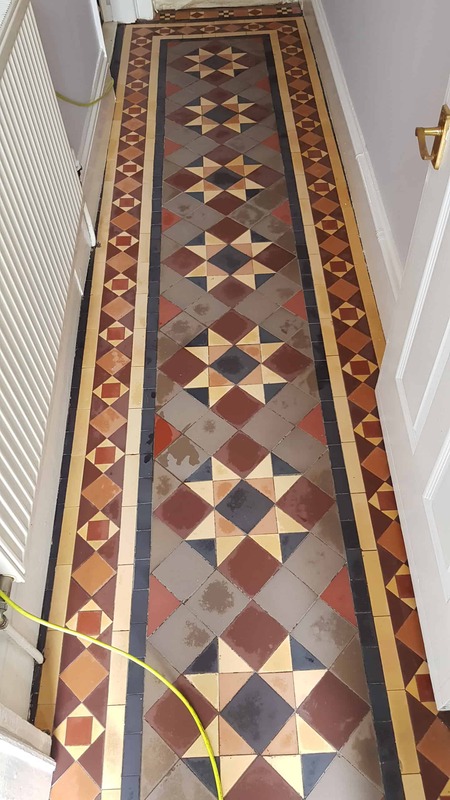 This sealer is also fully breathable which makes it ideal for floors such as Victorian tiles where the age of the property means damp can be an issue. The job was completed, and the floor had been returned to its’ previous vibrant look. The customer was very happy and could see how much easier it would now be to maintain. The property now looked how you would expect when you opened the front door!